The last time Russian director Aleksandr Sokurov was on the Lido he won the Golden Lion with his boisterous and vivid interpretation of Goethe’s Faust (2011). In the running once more for the top price at the 72nd Venice Film Festival, Francofonia (2015) is a chatty and occasionally brilliant rumination on art, history and death. Like Prospero, Sokurov himself is locked in his cell, his cluttered Parisian apartment, surrounded by his art books, his post it notes stuck to his Apple computer as he mutters away about the theme of his film. The camera like Ariel swoops and glides beautifully through Paris to his unifying theme – the Louvre, the objective correlative for all of the director’s preoccupation with art. Via Skype, Sokurov receives calls from Dirk, a ship’s captain who is transporting artworks across the ocean in a hulking container ship beset by high seas and savage winds. The art might be lost forever, lives also might be sacrificed and this leads to the idea of the Louvre at war, when, following the fall of France the museum was turned over to the Nazis – the artworks themselves safely hidden away in a nearby château. The civil servant responsible is Jacques Jaujard (Louis-Do de Lencquesaing), a man who secretly despises the Nazis and helps the resistance but he finds in the Nazi functionary now in charge of the museum an unlikely ally Count Wolff-Metternich (Benjamin Utzerath). Their friendship is a proto-European Union and their uneasy alliance is tensely maintained, at great risk to both men. Meanwhile, Napoléon (Vincent Nemeth) wanders the Louvre, exclaiming excitedly “C’est moi!” in front of his portraits. Also, the spirit of the Revolution, Marianne (Johanna Korthals Altes), dances about in the weakest element of the film by far, a flimsy silly idea which makes the political ideals of the French Revolution into an annoying bit of interpretive dance. The biography of the Louvre sometimes stops for a moment and a particular work is examined with such a wonderful light and gaze that it feels as if Sokurov is showing us how to look. Look here and this most famous painting, the most famous painting in the world. Keep looking. The history of the French under occupation, the meaning and survival of art in a time of war is particularly timely given the destruction or semi-destruction of Palmyra by ISIS among other similar calamities. Sokurov links war and art and is unsentimental in his understanding of the Louvre as repository for war trophies and perhaps a raison d’etre for war itself. If Sokurov is a Prospero, he must finally break his staff and drown his books. This is done when he turns his attention for a moment away from his beloved France and towards his beloved Russia where, while the artworks of the Louvre were being cared for by an alliance between a resistance fighter and a Nazi, the children were dying in the snow and no such cooperation was in evidence. Its a stunning moment -one of many. 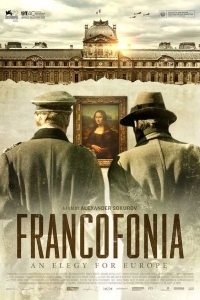 If Francofonia is indulgent at times, and meanders the halls and galleries of our European cultural heritage, it’s one which is enlivened by Sokurov’s own idiosyncratic wit and the Ariel like powers of cinema itself.